I finished Week 2 Day 1 of the RunDouble C25k app this morning. After that, I went for a walk around the park as well. I did not go on my second walk, so I still have a couple hundred steps to hit my 10,000 step goal. This coming Saturday, I am bowling with out Match Club. We are having our Holiday get together. So just our club. Bowling a No-Tap tournament style. No-Tap means if you knock down 9 pins in the first ball, it counts as a strike. There is going to be lots of food. Much of which, I can’t have. The biggest problem I see, is trying to guess my portions when I try to put them into Chronometer. I think I might just fast until then, or just have a light snack before going there. Pretty much hit all my goals yesterday for health stuff. 1586 Calories, 9 net carbs. 1613 calories remaining. Could have eaten a few more calories last night, but I didn’t want to over extend without knowing how much I could do. I was a little hunger later on, but that just have been in my head. 11:36 PM to 7:00 AM. 6 hrs 59 mins. 16 x awake for 25 minutes. I got reading on time, and headed to bed with plenty of time. This is like the third night in a row I have woke up between 4 and 5 AM. Don’t know what’s up with that. Still better sleep then I had the previous couple of nights. I took a little longer in the day to get to my workouts, but I did get it in there. Here it is, Monday wrap up time! Overall, I felt like this was one of my best weeks all year. I got in my runs despite the rain. I got in my step goal all week. I even put in over 8,000 steps on my “rest day”. Then, I also did my workouts. One in the complex gym. All of this, and I hit my goal of 1000 of greater calories deficit. This week I did it. I broke into the 100 lbs lost category. 102.5 lbs since January 1st. 2.8 lbs this week. 257 lbs is my all time low (that I can recall in adulthood). I hope to be able to hit that before my Nerdfitness challenge is over. (December 23rd) It is weird to be thinking of the new year already, but I hope to enter it at my lowest weight! 11/28 – 1926 Calories, 11 g net carbs. 1088 calories remaining. 12/01 – 1862 Calories, 12 net carbs. 1100 Calories remaining. 12/02 – 1330 Calories, 14 net carbs. 1162 Calories remaining. Each day, I did it. Some days I was able to eat quite a bit. Other days, I stayed lower. It seemed to be OK though. I did one meal yesterday. The others I usually have 2. 11/27 – 11:35 PM to 6:59 AM. 7 hrs 5 mins. 12 x awake for 19 mins. 11/28 – 11:25 PM to 7:00 AM. 7 hrs 11 mins. 13 x awake for 24 mins. 11/29 – 11:37 PM to 7:01 AM. 6 hrs 54 mins. Awake for 30 mins. 11/30 – 11:39 PM to 6:35 AM. 6 hrs 27 mins. 15 x awake for 29 mins. Last couple of nights, I had a little trouble getting to sleep. I was in bed on time each night, and I did get in my reading before hand. 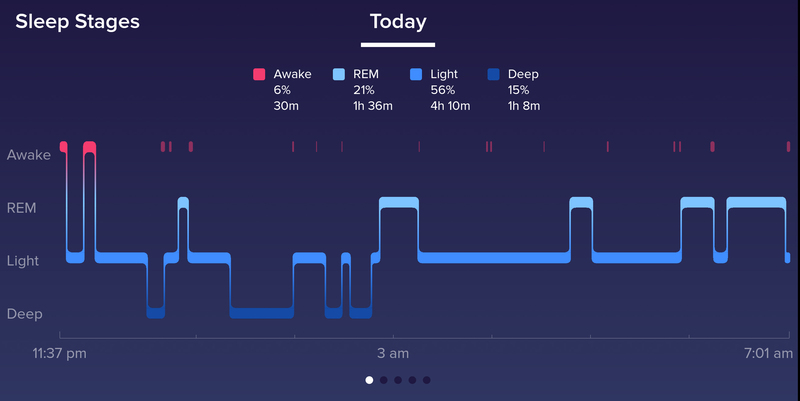 Most nights this week, I had decent sleep. Hopefully, I will return to that. I got it all in this week. 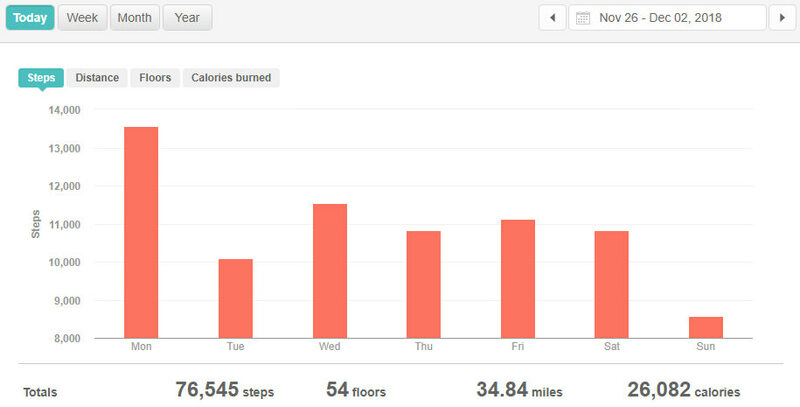 Barely made steps on Tuesday. Still got in over 8,000 steps on rest day. I did run all 3 scheduled days. I also was able to get in all my workouts. 3 x 10 lat pull down bar. on set was 50 lbs each side. 2 sets were 70 lbs each side. More of the same! I need to keep this momentum rolling. I feel a bit behind today, but hopefully, can get all caught up. It is rest day for me. Though, I didn’t really rest that much. This morning I headed out to walk around Lake Elizabeth. About 7,000 steps total. I didn’t push it or anything though. Mostly played some Pokemon Go while getting in some steps. Then came home and made my food for the night. Fasted until just about 3:45 PM. I made myself a Chicken Crust pizza, plus a nice sized salad. Then finished off with some ice cream. 😉 Still within my calories thanks to the steps this morning. I got in my run, and overall, it was a successful day. 1862 Calories, 12 net carbs. 1100 Calories remaining. 11:48 PM to 5:25 AM. 5 hrs 3 mins. 11 x awake for 34 minutes. I got to reading on time, and headed off to bed with plenty of time too. I was in bed by 11:35 PM, but struggled to get to sleep. Not the greatest night of sleep, but I tried haha. 10,821 steps. 108 Active minutes. C25k Week 1 Day 3 completed. On to week 2! Start of the new week tomorrow. Back to the normal grind. I’ll get up a week in review post. I’ll have to get all my items done, and have bowling too. Busy busy! This morning I did not get up with my alarm apparently. I wanted to get up and try running before we went off to my son’s bowling. With that not happening, I wasn’t sure what I was going to do. I finished off my run. Week 1 day 3 of the Rundouble C25k finished! I even tried to run harder on the last interval. I got that 9:23 min/mile mark. No way I am ready to sustain that yet haha. I figured it was late enough, that I went ahead and just continued walking around the track I was running at. Until I was at 10,000 steps. I was certainly wiped out, and ready to come home and eat. I also got in my shipment of ice cream yesterday. 🙂 It is nice to have a good day of working out, and finish it off with some great ice cream. I have Chocolate Chip Cookie dough flavor this time. It is pretty good. I really enjoyed the Mint Chocolate chip last time. I don’t have any Rebel Creamery near me in stores, so I have to order by the case at their website. All in all, a good day. I weighed in, and finally broke the 100 lbs lost this year mark. It seems like things are really working out well this week. I have been hard at it with watching what I eat, and making sure I get in the work with workouts and running. 1743 Calories, 9 net carbs. 1140 Calories remaining. 11,128 steps, 103 active minutes. No run scheduled. Got my workout done in my apartment. Tomorrow is rest day. Boy, I feel like I need it too! I still plan to walk a little bit though. I just don’t want to push hard for 10,000. The Pokemon Community weekend is still going on. I think I will probably just go walk around the nearby Lake Elizabeth, while I play some Pokemon Go. Then I just need to make sure I don’t consume too much food, and I should be good to go. I might even go with a longer fast, then Hit up One meal tomorrow. It’s Friday! How has everyone’s week been going? I noticed I am feeling the weight of getting all the exercise in this week. My body is ready for “rest” day. haha. Got out this morning, and completed walk number 1. Almost to 5,000 steps. So I still need to push another 5,000 or so still. Also finished my workout today. At some point, I need to cook a bit more food for me. I am almost out of all my “convenience” foods. Things went really well yesterday, despite some hiccups. I was a bit late to finish my 10,000 steps. My second walk didn’t happen until after bowling. My wife had a doctor’s appointment that I took her too. Her car started acting up a bit. I also hadn’t posted to the blog yet, so I was doing that on my phone, while I was bowling. It actually was working out OK. I just needed to make a couple of tweaks from home. 1671 Calories, 8 net carbs. 1482 Calories remaining. I ate a little less yesterday. Mostly since I was a little behind with getting my steps in. I didn’t want to go to far over my limit, and not be able to make it up. Everything ended up working out. Got into bed on time. Slept well enough. Had a weird dream, and it woke me up early. 10,825 steps. 62 active minutes. I mentioned in my last blog about running out there in the rain also. So I did completed Week 1 Day 2 of the RunDouble C25k app. Still to come, running tomorrow! That will finish off my week of doing things each day. Sunday will be a rest day, buy I plan on walking a little bit still. I want to build up the calories I can eat. 😉 There is a special Pokemon Community Day (weekend) that starts today, and lasts until Monday I think. So plenty of special stuff to get out there and catch! I’m off bowling now. I still need to get in my steps for the day. I had a pretty good day yesterday. Pretty much got my goals for the day. Even worked out in the gym complex. Dumbbells and a little bit of the weight machine. 1926 Calories, 11 g net carbs. 1088 calories remaining. Overall my sleep has felt better. I have woke up a couple of times, but overall I am feeling rested. 11,543 steps. 124 active minutes. Had rain, so I worked on the treadmill for 45 minutes, then did my workout. It felt pretty good. Workout day tomorrow. Looks like more storms on the way. I might just have more treadmill days ahead. We had a bit of raid this morning. I elected not to go walking around in it. Instead, I came back to the apartment. Once I was back here, I headed off to the gym in our complex. Nothing fancy, but decent enough. I hit the treadmill, then decided to hit up a workout there as well. Plus I got about 6,500 step in. 40 minutes of walking. 2038 Calories, 10 net carbs. 1022 calorie deficit. Not too bad. 11:25 PM to 7:00 AM. 7 hrs 11 mins. 13 x awake for 24 mins. I got to reading a bit early, and headed to bed before the alarm went off. 10,083 steps. 114 active minutes. Just barely made the steps. I could have went out for more if I needed. I also got out and did Day 1 of C25k. I haven’t checked my past runs, but it felt like this day 1 was really good.